Many youth -unconsciously- view themselves as the anonymous, dilettante hero who appears in the opening scenes of many films and novels; the hero who attempts to overcome barriers to set out on his life’s journey. Just like the 120 people who will take part in the forthcoming LABIC (Civic Innovation Lab) at Cartagena (Colombia) during two weeks. The attendees, who will hail from the Amazon or the Altiplano, from villages, neighborhoods or favelas, from universities or vocational schools, will participate in an open and experimental process of mutual learning to design and prototype a civic innovation project. They will break into interdisciplinary groups of ten people, each with its own magical powers (artists, engineers, communicators, makers, etc.). Their goal will be to defeat a monster (a social problem, a public challenge). To that end, they will have to invent a magical weapon (an app, a website, a prototype, a service, etc.). However, in every story worth telling the hero or heroine has a key ally: the mentor. The word was inspired by the character of Mentor in The Odyssey to whom Ulysses entrusted the care of his son Telemachus before leaving Troy. 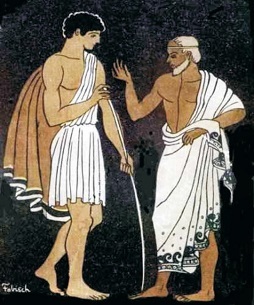 Eventually, Mentor became the tutor and travel companion of the young hero Telemachus. SEGIB has asked me to write briefly about the figure of the mentor in LABIC, and I could think of no better way than by talking about heroes, journeys, weapons and monsters. The mentor gives advice but does not direct; guides but does not lead. He accompanies and empowers his mentee. The mentor inspires without offering solutions, preferring to raise new questions. The mentor does not defeat the monster nor provide a magical weapon; the mentor questions who is really the monster or the need to use a weapon. The mentor teaches you to think differently. That is at least what Rodrigo Savazoni, Cinthia Mendonça, Andreiza Anaya and I will seek to do at the forthcoming LABICCO*. Finally, and to complete the hero’s journey, you are probably wondering: how does the story end? As in all epic journeys, victory itself is not the end, the goal, because you cannot always win. A laboratory is a space for assays, experimentation, trial and error and, sometimes, even failures. The unfailing end is none other than to return to the starting point, to the small village whence the hero or heroine ventured forth, with a wealth of new memories, new skills and new friends acquired during the adventure and, especially, with a new way of understanding and behaving in the world. The end of the story is not a “THE END”, but rather a “TO BE CONTINUED” that heralds endless and legendary adventures in the future. *LABICCO is the 3rd edition of LABIC (previous were LABICMX and LABICBR), and this year will be organized by the Civic Innovation Project of SEGIB in joint with the Ministry of Culture of Colombia, in partnership with Medialab-Prado, AECID, Ford Foundation and Fundación Unidos en Red.